Happy Frugal Christmas! 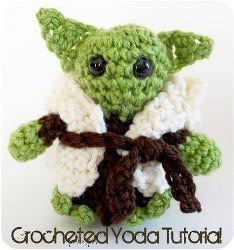 : CROCHET YOUR OWN YODA FOR STAR WARS FANS! THE CHRISTMAS CHUTNEY IS MADE! WAYS TO (NOT) PAY FOR CHRISTMAS! CROCHET YOUR OWN YODA FOR STAR WARS FANS! LOADS OF FREE CHRISTMAS ACTIVITIES FOR KIDS! Yes - it's true you or one of your very lucky friends or relatives, can crochet Yoda from this free pattern - great Christmas present - what are you waiting for?